At the bottom of the Seafoam Islands is the Legendary Pokemon Articuno. In order to have the opportunity to catch Articuno, you must first defeat it in battle. 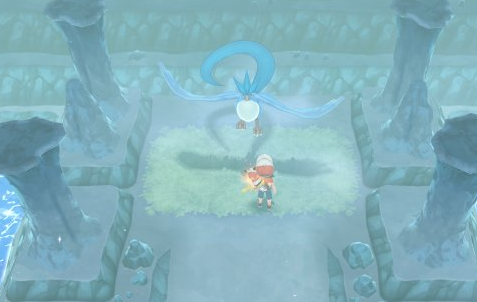 The battle will have a five minute time limit, and Articuno will have all of its Stats raised as the battle begins. Luckily, Articuno is a dual Ice / Flying Type Pokemon, meaning it's especially weak to Rock Type Attacks. (It's also extremely weak to Fire Type Attacks and Electric Type Attacks.) After defeating Articuno in battle, you will be able to catch it like any other Wild Pokemon Encounter. Ultra Balls and Razz Berries work best on Articuno when trying to capture it.